Welcome to Cody's Cars of Great Falls, Montana. 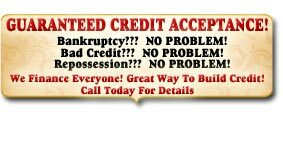 If you need help buying a car because of credit problems we can help! Stop by our lot on 10th Avenue South and see how we can help finance your next set of wheels. You can also see some of our latest deals in our Auto Chaser ad too! Copyright © 2007 Codys Cars Selling Used Cars and Trucks in Great Falls Montana. All rights reserved.